This is “Priority, Termination of the Mortgage, and Other Methods of Using Real Estate as Security”, section 17.2 from the book Legal Aspects of Property, Estate Planning, and Insurance (v. 1.0). For details on it (including licensing), click here. Understand why it is important that the mortgagee (creditor) record her interest in the debtor’s real estate. Know the basic rule of priority—who gets an interest in the property first in case of default—and the exceptions to the rule. Recognize the three ways mortgages can be terminated: payment, assumption, and foreclosure. Be familiar with other methods (besides mortgages) by which real property can be used as security for a creditor. You may recall from Chapter 16 "Secured Transactions and Suretyship" how important it is for a creditor to perfect its secured interest in the goods put up as collateral. Absent perfection, the creditor stands a chance of losing out to another creditor who took its interest in the goods subsequent to the first creditor. The same problem is presented in real property security: the mortgagee wants to make sure it has first claim on the property in case the mortgagor (debtor) defaults. The general rule of priority is the same for real property security as for personal property security: the first in time to give notice of the secured interest is first in right. For real property, the notice is by recordingThe official filing of a legal document (a mortgage or a deed) so as to inform the world of it. the mortgage. Recording is the act of giving public notice of changes in interests in real estate. Recording was created by statute; it did not exist at common law. The typical recording statute calls for a transfer of title or mortgage to be placed in a particular county office, usually the auditor, recorder, or register of deeds. A mortgage is valid between the parties whether or not it is recorded, but a mortgagee might lose to a third party—another mortgagee or a good-faith purchaser of the property—unless the mortgage is recorded. There are exceptions to the general rule; two are taken up here. The fixture-filing provision in Article 9 of the UCC is one exception to the general rule. As noted in Chapter 16 "Secured Transactions and Suretyship", the UCC gives priority to purchase-money security interests in fixtures if certain requirements are met. A bank might make advances to the debtor after accepting the mortgage. If the future advances are obligatory, then the first-in-time rule applies. For example: Bank accepts Debtor’s mortgage (and records it) and extends a line of credit on which Debtor draws, up to a certain limit. (Or, as in the construction industry, Bank might make periodic advances to the contractors as work progresses, backed by the mortgage.) Second Creditor loans Debtor money—secured by the same property—before Debtor began to draw against the first line of credit. Bank has priority: by searching the mortgage records, Second Creditor should have been on notice that the first mortgage was intended as security for the entire line of credit, although the line was doled out over time. However, if the future advances are not obligatory, then priority is determined by notice. For example, a bank might take a mortgage as security for an original loan and for any future loans that the bank chooses to make. A later creditor can achieve priority by notifying the bank with the first mortgage that it is making an advance. Suppose Jimmy mortgages his property to a wealthy dowager, Mrs. Calabash, in return for an immediate loan of $20,000 and they agree that the mortgage will serve as security for future loans to be arranged. The mortgage is recorded. A month later, before Mrs. Calabash loans him any more money, Jimmy gives a second mortgage to Louella in return for a loan of $10,000. Louella notifies Mrs. Calabash that she is loaning Jimmy the money. A month later, Mrs. Calabash loans Jimmy another $20,000. Jimmy then defaults, and the property turns out to be worth only $40,000. Whose claims will be honored and in what order? Mrs. Calabash will collect her original $20,000, because it was recited in the mortgage and the mortgage was recorded. Louella will collect her $10,000 next, because she notified the first mortgage holder of the advance. That leaves Mrs. Calabash in third position to collect what she can of her second advance. Mrs. Calabash could have protected herself by refusing the second loan. The mortgagor’s liability can terminate in three ways: payment, assumption (with a novation), or foreclosure. Unless they live in the home for twenty-five or thirty years, the mortgagors usually pay off the mortgage when the property is sold. Occasionally, mortgages are paid off in order to refinance. If the mortgage was taken out at a time of high interest rates and rates later drop, the homeowner might want to obtain a new mortgage at the lower rates. In many mortgages, however, this entails extra closing costs and penalties for prepaying the original mortgage. Whatever the reason, when a mortgage is paid off, the discharge should be recorded. This is accomplished by giving the mortgagor a copy of, and filing a copy of, a Satisfaction of Mortgage document. In the Paul H. Cherry v. Chase Manhattan Mortgage Group case (Section 17.4 "Cases"), the bank mistakenly filed the Satisfaction of Mortgage document, later discovered its mistake, retracted the satisfaction, accelerated the loan because the mortgagor stopped making payments (the bank, seeing no record of an outstanding mortgage, refused to accept payments), and then tried to foreclose on the mortgage, meanwhile having lost the note and mortgage besides. The property can be sold without paying off the mortgage if the mortgage is assumed by the new buyer, who agrees to pay the seller’s (the original mortgagor’s) debt. This is a novation if, in approving the assumption, the bank releases the old mortgagor and substitutes the buyer as the new debtor. The buyer need not assume the mortgage. 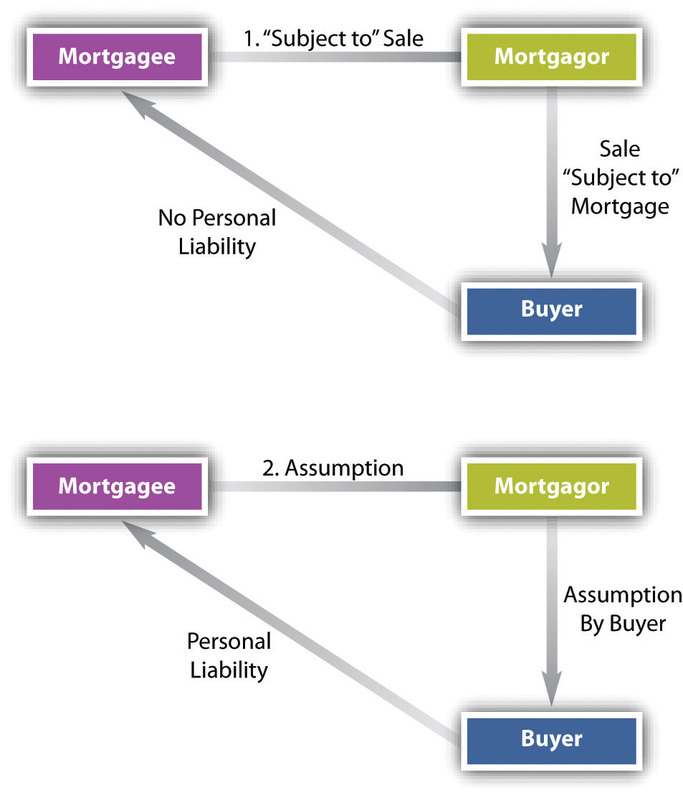 If the buyer purchases the property without agreeing to be personally liable, this is a sale “subject to” the mortgage (see Figure 17.3 "“Subject to” Sales versus Assumption"). In the event of the seller’s subsequent default, the bank can foreclose the mortgage and sell the property that the buyer has purchased, but the buyer is not liable for any deficiency. What if mortgage rates are high? Can buyers assume an existing low-rate mortgage from the seller rather than be forced to obtain a new mortgage at substantially higher rates? Banks, of course, would prefer not to allow that when interest rates are rising, so they often include in the mortgage a due-on-sale clauseA contract clause requiring the entire mortgage amount be paid to the mortgagee if the property is sold; it prevents any assumption., by which the entire principal and interest become due when the property is sold, thus forcing the purchaser to get financing at the higher rates. The clause is a device for preventing subsequent purchasers from assuming loans with lower-than-market interest rates. Although many state courts at one time refused to enforce the due-on-sale clause, Congress reversed this trend when it enacted the Garn–St. Germain Depository Institutions Act in 1982.12 United States Code, Section 1701-j. The act preempts state laws and upholds the validity of due-on-sale clauses. When interest rates are low, banks have no interest in enforcing such clauses, and there are ways to work around the due-on-sale clause. The third method of terminating the mortgage is by foreclosure when a mortgagor defaults. Even after default, the mortgagor has the right to exercise his equity of redemption—that is, to redeem the property by paying the principal and interest in full. If he does not, the mortgagee may foreclose the equity of redemption. Although strict foreclosure is used occasionally, in most cases the mortgagee forecloses by one of two types of sale (see Figure 17.4 "Foreclosure"). The first type is judicial saleA court-ordered sale of property by a public official, such as the sheriff.. The mortgagee seeks a court order authorizing the sale to be conducted by a public official, usually the sheriff. The mortgagor is entitled to be notified of the proceeding and to a hearing. The second type of sale is that conducted under a clause called a power of saleA term allowing the mortgagee to sell real estate upon mortgagor’s default without going to court., which many lenders insist be contained in the mortgage. This clause permits the mortgagee to sell the property at public auction without first going to court—although by custom or law, the sale must be advertised, and typically a sheriff or other public official conducts the public sale or auction. Once the property has been sold, it is deeded to the new purchaser. In about half the states, the mortgagor still has the right to redeem the property by paying up within six months or a year—the statutory redemption period. Thereafter, the mortgagor has no further right to redeem. If the sale proceeds exceed the debt, the mortgagor is entitled to the excess unless he has given second and third mortgages, in which case the junior mortgagees are entitled to recover their claims before the mortgagor. If the proceeds are less than the debt, the mortgagee is entitled to recover the deficiency from the mortgagor. However, some states have statutorily abolished deficiency judgments. Besides the mortgage, there are other ways to use real estate as security. Here we take up two: the deed of trust and the installment or land contract. The deed of trustA type of mortgage where title to the property is nominally in a trustee, who sells if the buyer defaults; it provides for a nonjudicial foreclosure. is a device for securing a debt with real property; unlike the mortgage, it requires three parties: the borrower, the trustee, and the lender. Otherwise, it is at base identical to a mortgage. The borrower conveys the land to a third party, the trustee, to hold in trust for the lender until the borrower pays the debt. (The trustee’s interest is really a kind of legal fiction: that person is expected to have no interest in the property.) The primary benefit to the deed of trust is that it simplifies the foreclosure process by containing a provision empowering the trustee to sell the property on default, thus doing away with the need for any court filings. The disinterested third party making sure things are done properly becomes the trustee, not a judge. In thirty states and the District of Columbia—more than half of US jurisdictions—the deed of trust is usually used in lieu of mortgages.The states using the deed of trust system are as follows: Alabama, Alaska, Arkansas, Arizona, California, Colorado, District of Columbia, Georgia, Hawaii, Idaho, Iowa, Michigan, Minnesota, Mississippi, Missouri, Montana, Nevada, New Hampshire, North Carolina, Oklahoma, Oregon, Rhode Island, South Dakota, Tennessee, Texas, Utah, Virginia, Washington, West Virginia, Wisconsin, and Wyoming. But the deed of trust may have certain disadvantages as well. For example, when the debt has been fully paid, the trustee will not release the deed of trust until she sees that all notes secured by it have been marked canceled. Should the borrower have misplaced the canceled notes or failed to keep good records, he will need to procure a surety bond to protect the trustee in case of a mistake. This can be an expensive procedure. In many jurisdictions, the mortgage holder is prohibited from seeking a deficiency judgment if the holder chooses to sell the property through nonjudicial means. Alpha Imperial Building, LLC v. Schnitzer Family Investment, LLC, Section 17.4 "Cases", discusses several issues involving deeds of trust. Under the installment contract or land contractThe buyer makes installment payments on a real estate purchase, the title shifting when all payments are made., the purchaser takes possession and agrees to pay the seller over a period of years. Until the final payment, title belongs to the seller. The contract will specify the type of deed to be conveyed at closing, the terms of payment, the buyer’s duty to pay taxes and insure the premises, and the seller’s right to accelerate on default. The buyer’s particular concern in this type of sale is whether the seller in fact has title. The buyers can protect themselves by requiring proof of title and title insurance when the contract is signed. Moreover, the buyer should record the installment contract to protect against the seller’s attempt to convey title to an innocent third-party purchaser while the contract is in effect. The benefit to the land contract is that the borrower need not bank-qualify, so the pool of available buyers is larger, and buyers who have inadequate resources at the time of contracting but who have the expectation of a rising income in the future are good candidates for the land contract. Also, the seller gets all the interest paid by the buyer, instead of the bank getting it in the usual mortgage. The obvious disadvantage from the seller’s point is that she will not get a big lump sum immediately: the payments trickle in over years (unless she can sell the contract to a third party, but that would be at a discount). The general rule on priority in real property security is that the first creditor to record its interest prevails over subsequent creditors. There are some exceptions; the most familiar is that the seller of a fixture on a purchase-money security interest has priority over a previously recorded mortgagee. The mortgage will terminate by payment, assumption by a new buyer (with a novation releasing the old buyer), and foreclosure. In a judicial-sale foreclosure, a court authorizes the property’s sale; in a power-of-sale foreclosure, no court approval is required. In most states, the mortgagor whose property was foreclosed is given some period of time—six months or a year—to redeem the property; otherwise, the sale is done, but the debtor may be liable for the deficiency, if any. The deed of trust avoids any judicial involvement by having the borrower convey the land to a disinterested trustee for the benefit of the lender; the trustee sells it upon default, with the proceeds (after expenses) going to the lender. Another method of real property security is a land contract: title shifts to the buyer only at the end of the term of payments. A debtor borrowed $350,000 to finance the purchase of a house, and the bank recorded its interest on July 1. On July 15, the debtor bought $10,000 worth of replacement windows from Window Co.; Window Co. recorded its purchase-money security interest that day, and the windows were installed. Four years later, the debtor, in hard financial times, declared bankruptcy. As between the bank and Windows Co., who will get paid first? Under what interest rate circumstances would banks insist on a due-on-sale clause? Under what interest rate circumstance would banks not object to a new person assuming the mortgage? What is the primary advantage of the deed of trust? What is the primary advantage of the land contract? A debtor defaulted on her house payments. Under what circumstances might a court not allow the bank’s foreclosure on the property?